The human body is an extremely complex molecular machine, the details of which can be followed through certain substances; so-called biomarkers. Unfortunately, it is not yet possible to monitor biomarkers live in patients when these are present in minuscule concentrations. Researchers at Eindhoven University of Technology have now developed a new technique that can become the plain and simple solution for the live and super-sensitive monitoring of biomarkers. They report on it in Nature Communications. Substances that are essential for the body, such as proteins and hormones, are present in the blood in pico- or nanomolar concentrations. These are concentrations comparable to 1 sugar grain dissolved in an Olympic-sized swimming pool - extremely low, and difficult to measure. In the Molecular Biosensing for Medical Diagnostics group at Eindhoven University of Technology, under the guidance of Professor Menno Prins, a sensing technology has been developed that enables the super-sensitive measurement of biomarker concentrations over time. The technique is based on the fact that tiny particles in liquid are continuously in Brownian motion because water molecules collide with them. The researchers bound the particles through a nanostrand to a glass plate, causing the particles to wiggle back and forth. The biomarker to be measured binds temporarily to specific adhesive molecules that are fixed to both the particles and the plate. When a biomarker molecule attaches itself to both a wiggling particle and to the plate, the particle suddenly becomes attached, which greatly reduces its mobility - until the biomarker is released again. The mobility of the particles, which are coupled to the transparent glass, could be easily observed by the researchers with light. They have given their technology the name BPM: Biomarker monitoring based on sensing of Particle Mobility. Every time a wiggling particle suddenly moves less, and then more, one biomarker molecule has been observed. The number of these events per minute reveals the concentration of the biomarker in the liquid with a high degree of sensitivity. The beauty of the BPM sensor technology is that it has digital precision, and that both increases and decreases in biomarker concentration over time can be monitored. The technique has now been demonstrated for the monitoring of protein and DNA. 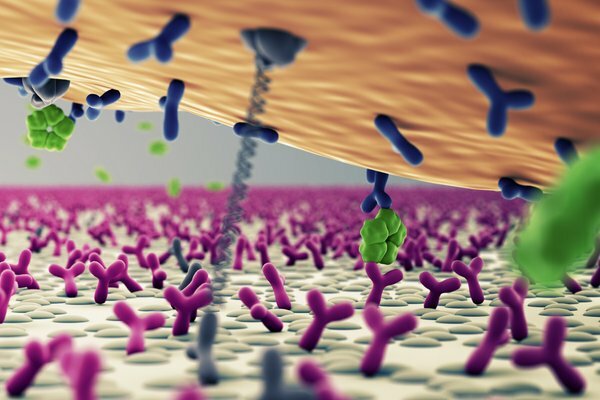 The technology is widely applicable, because suitable adhesion molecules are available for almost all biomarkers. This flexibility, combined with the sensitivity and the expected miniaturization of the technology, means that Prins and his fellow researchers have high expectations of the future for their technology. "We anticipate that a completely new class of sensors for the monitoring of biomarkers will emerge from this," says the professor, so he is creating a start-up that will develop practical sensors and applications. One of the possibilities is to connect a sensor to a catheter with which patients in the operating room or in the intensive care unit can be accurately monitored. In addition to medical applications, Prins also thinks there are possibilities for monitoring biomolecules in industrial processes and water purification.